Home / Snacks / Nutritious Super Bowl Eats? Yes, It’s Possible! Nutritious Super Bowl Eats? Yes, It’s Possible! As you know if you follow sports at all, this weekend is the Super Bowl. Every single one of those foods is full of acid! But the good news is that you can watch the game and indulge in some delicious, low acid foods you’re going to love. Today I want to share some recipes with you that are going to feel right at home during the big game, but they’re full of healthy, raw nutrients instead of acid. All of these recipes are easy for your digestive system to process, bursting with vitamins and minerals, and are alkaline, so they’ll give you plenty of energy as you watch the game this weekend. Soak garbanzo beans overnight fully submerged in filtered water. In the morning, strain garbanzo beans in a strainer and let the strainer sit for 12 hours minimum before using (this is called sprouting). The garbanzo beans may swell almost twice their original size. Add all the ingredients to a food processor, and blend until creamy and smooth. Serve with vegetable sticks. 1 head of cauliflower, chopped into bite-sized pieces. Preheat oven to 400º. Toss all the ingredients together on a baking sheet. Roast for 25 – 30 minutes until browned and crispy. Blend low for 1 minute to keep chia intact, OR mix chia in with a spoon (gently stir), then set in refrigerator for 3-5 hours. Garnish with cacao nibs shavings. Combine 1 tablespoon of the cilantro with 1 teaspoon of the onion and 1 teaspoon of the jalapeño in a medium mixing bowl. Add the salt and using the back of a spoon push the ingredients against the bottom of the bowl to completely mash. 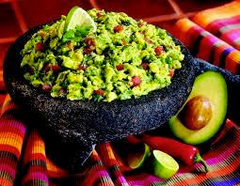 Add the avocados into the mixture, and using a fork, mash the avocados into the mixture to make an almost smooth, but still chunky, blend. Add in the remaining cilantro, onion, and jalapeño. Stir in the tomatoes and lime juice and season to taste. Serve with your favorite veggie sticks and enjoy! Place all ingredients in the food processor with the “S” blade, pulse a few times first to chop ingredients, and then switch to blend in the food processor to obtain desired consistency. Let sit for an hour then serve. I’d love to hear what you’re going to make for the Super Bowl. All of these recipes come from the Get Off Your Acid 7-Day Cleanse.